This issue, we are fortunate enough to interview poet Michael Routery. A Celtic Reconstructionist, Routery’s poetry has appeared in a number of anthologies — as well as in the pages of EHS. Here, he discusses his first collection, From the Prow of Myth; the importance of living in an enchanted, mythologized world; and his future projects. Eternal Haunted Summer: If you could correct one misconception about modern polytheism, what would it be? Michael Routery: There’s a widely embedded idea that polytheism is primitive, less evolved than monotheism, that it was a ‘stage’ that spirituality went through before monotheism, or atheism. This is based on now discredited notions of cultural evolution that still seem to be commonplace in religious studies. I’d like people to realize it is actually a sophisticated way; seeing and orienting to the divine as diverse and multiple is a sensible and liberatory way to approach divinity in our post-modern world. I also think it can foster beneficial ways of relating to the multitude of life. It certainly makes sense of my own experience. EHS: How do you define your personal spiritual path? MR: My primary path is a Celtic reconstructionist one, a central part of which is the practice of filidecht, the Irish term of visionary poetic practices (what from a British point of view would be termed the bardic), and Druidism. I would note I work to make my practice engage the land I am living on (as a North American on the Pacific coast). I also devoted to various Mediterranean deities and persons. EHS: Your poetry collection is entitled From the Prow of Myth. What is the origin of that title? MR: It comes from my project of revitalizing myth as a valuable form of knowing the world, in the sense we can see it in the archaic Greeks, and among Celtic cultures, and for that matter through much of the world, especially in oral and archaic traditions. It is opposed to the logic of disenchantment, which sees myth as false stories (a logic that dates back to Plato’s banning the poets from his ideal city in The Republic unless they reconfigured themselves into state propagandists, a logic arising from huge socio-political transformations taking place in the 4th century BCE Greek cities). Myth is a way of knowing, a type of truth that has been largely devalued in western cultures and I think to our great harm and diminishment of imagination. Specifically, the prow is a metaphor for the poetic vehicle of consciousness that forges ahead into the seas of vision (I think of Rimbaud’s Drunken Boat!). But specifically the Gaelic lore describes the Tuatha Dé Danann landing in Ireland on boats that came from mysterious islands in the “north”. I hope my poems can provide glimpses of such deeper openings of mythic insight. 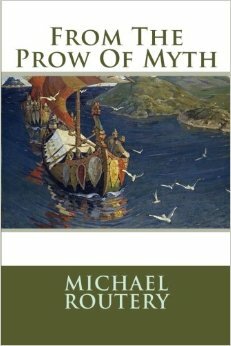 EHS: What kind of research went into writing From the Prow of Myth? Are there stacks of books on your desk? Did you go for long walks? Meditate? MR: I’ve been passionately reading mythology ever since I was a young child (fortunately my mother and my grandparents fostered this kind of reading), and research is part of my practice of CR and Druidism; I have a fascination for comparative Indo-European mythology, so it’s just something I do. While I don’t compose with stacks of books on my desk (but my home is filled with books! ), I am likely after a first draft to look something up to make sure I’ve got a bit of lore right, add an epithet, or what have you. In some cases I do first immerse myself in the appropriate lore or myth. Then allowing for the bringing forth (in the Heideggerian sense), a making in a moment of standing aside. It’s no accident that Amairgen, Suibhne, Taliesin, and Orpheus occupy prominent places in the book. A number of the poems such as “Viridescence”, “San Gregorio”, and “Crabapple” come directly out of the incubatory practice of filidecht (light trance induced in an enclosed darkened space like a hut). The Suibhne poems come from working with the geilt (outsider) Gaelic tradition in feral places. Many come from opening to imbas (Irish term for inspiration in the mantic, visionary sense). The ecological poems in the last section come from experiences in the places addressed (yes, much walking involved). EHS: How important is personal experience and insight in crafting your poems? MR: As above, it’s extremely important. Otherwise it would be a rote activity and would result in wooden poems. EHS: I have heard from other poets that sometimes a poem will come easily, while others are a struggle. Which were the most difficult poems in the collection to write? And how did you finally complete them? MR: The poems that come most centrally from personal experience: flow, come forth. I do tend to obsess about lineation and other craft details, though. But difficult to write? That would be “For Apollo”. I’m not generally a big fan of rhymed poetry of the metered systems that were most popular from, let’s say, around 1500 to 1900, but I felt Apollo needed a sonnet. The constraints of that form with the desire to say particular things can be quite a challenge, and at times very frustrating. There’s always a fine balance between patterns of sound and meaning when using such forms — and so easy to sacrifice meaning for formal sound constraints. I wanted the form of the poems to be appropriate to the ones addressed, but that was by far the most difficult one. EHS: Are there any pieces that you were unable to include in From the Prow of Myth? Will we see them in a second collection? MR: There were a lot of eco-poems that did not make it in; some I had originally meant to include, but didn’t have direct animist quality and so a trusted poet friend suggested they didn’t fit that well considering the overall bent of the collection. I went with that. There are also plenty of new devotional poems, it’s just something that happens, and an important part of my practice, plus some that were a bit too obscure or for various other reasons didn’t make it in. The next collection will include many of them. EHS: Excellent and respectful poetry about the Gods and heroes can be difficult to find. Which books and authors would you recommend? 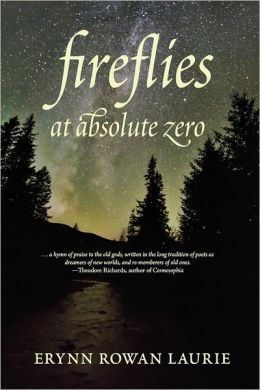 MR: I highly recommend Erynn Rowan Laurie’s Fireflies At Absolute Zero, and H. Jeremiah Lewis’ (Sannion) Strange Spirits. There’s also the collection of hymns, entitled The Phillupic Hymns by P. S. Virius Lupus. I heartily recommend various poems by William Butler Yeats, Constantin P. Cavafy, and Diane de Prima’s Loba (a cycle of poems to a wolf goddess). Some of the early Romantics like Keats come to mind, as well as H.D. and the Dithyrambs of Dionysus by the poet-philosopher Friedrich Nietzsche. I can’t suggest enough how important and rewarding it is to go back and read the ancients, even if in translation: Hesiod, Sappho, Alkman, Archilochus, Anakreon, Theognis, and the rest of the lyric poets. The Homeric Hymns are a great inspiration and the Celtic treasures such as those of Amairgen White-Kneed, Suibhne Geilt (check out the wonderful rendition by Seamus Heaney, Sweeney Astray) and the Welsh Taliesin traditions! MR: I have a magical realist novel that I am marketing. I am currently writing a ‘fantasy’ novel. I have plans to collect a lot of essays on pagan topics, many of which have been published elsewhere, into a collection. And of course there’s shaping the next collection of poems into a viable manuscript ….